Shares IP address with adult content site. New Zealand's signals intelligence and networks protection agency suffered potential embarrassment yesterday after its website went down for two hours and its backup arrangements also failed. The Government Communications Security Bureau or GCSB is responsible for eavesdropping on communications in the Pacific and New Zealand as part of the "Five Eyes" or AUSCANNZUKUS agreement, and cooperates with the UK's General Communications Headquarters (GCHQ) and the National Security Agency (NSA) of the United States. Whereas other government sites are run by the State Services Commission, the gcsb.co.nz website is hosted by NZ commercial provider Discountdomains. After Wednesday evening's failure, the domain pointed to two United States IP addresses belonging to web host provider Incapsula in Denver, Colorado. A domain name system (DNS) query done by iTnews at the time showed the GSCB site web address resolved to two IP addresses, 199.83.129.127 and 103.28.248.142. However, as there were no websites configured on either IP address, an error message was displayed instead to visitors. A spokesperson for GCSB confirmed the outage to iTnews but would only say "an internal issue" caused it. The spokesperson also said the GCSB used overseas webhosts as backup. "The site is hosted in New Zealand, but cached on servers in other parts of the world to provide more durable availability. It's a normal web security precaution." [See update]. The website outage followed a recent Intelligence Select Committee hearing during which internet mogul Kim Dotcom and prime minister John Key sparred over the filesharing tycoon's submission on a proposed new law that would substantially increase GCSB's powers to intercept local and international communications. GCSB was found to have illegally spied on Dotcom and other NZ citizens and residents in an official inquiry. Dotcom is currently awaiting a postponed hearing in March 2014 to decide if he and three other associates of his Megaupload file sharing site will be extradited to the United States to face charges of secondary copyright infringement. Update: The GCSB has corrected information it previously provided to iTnews, saying the GCSB website is not cached overseas. A spokesperson said the site and its content is hosted in New Zealand, and GCSB uses Incapsula as reverse proxy provider. 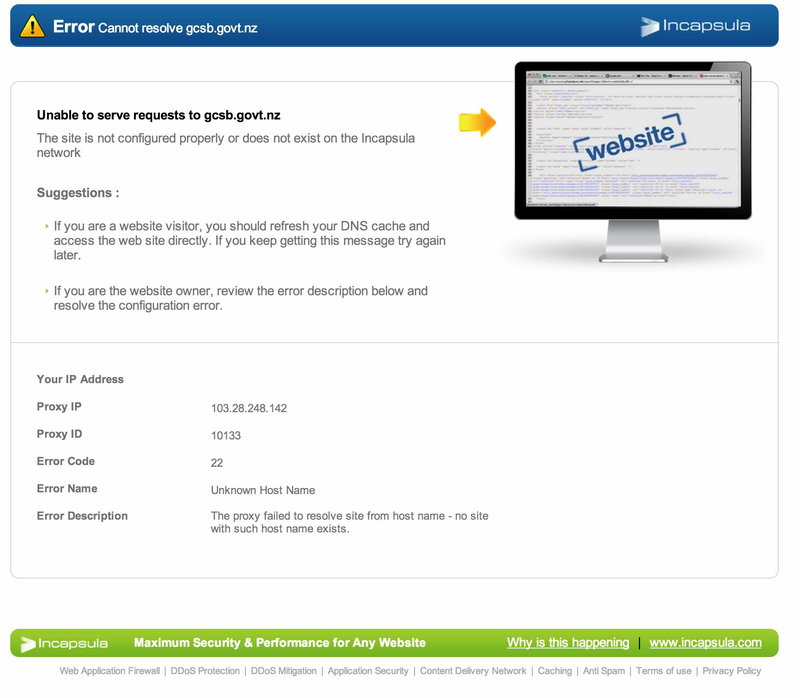 Users gain access to the GCSB website via Incapsula’s servers - the GCSB website is not hosted by Incapsula, a spokesperson said.